Nighttime accidents are a leading cause of motor vehicle accident fatalities and research from prominent national safety groups suggests a decrease in visibility, and an increase in the number of drunk, drugged and drowsy drivers may be to blame. Understanding the dangers associated with driving at night and employing smart driving tips can help keep you, your family, and others safer on the road. If you've already been involved in a nighttime accident, our team of skilled personal injury attorneys can help you explore your legal options. Even if you're an exceptionally safe driver, driving between dusk and dawn is statistically more dangerous than driving during the day. In fact, the risk of being involved in a fatal car accident is three times higher at night—with most accidents or near-crashes happening between the hours of midnight and 2 a.m. and 4 – 6 a.m.—according to research from the National Safety Council (NSC). Also, although Americans only do 25 percent of their driving at night, approximately 50 percent of traffic fatalities happen during nighttime hours. Statistics show that nighttime driving is always more dangerous, even when we're on familiar roads. Driving at night presents some specific and significant challenges, including reduced visibility. As much as 90 percent of a driver's ability to react to on-the-road situations is connected to visual factors, such as color recognition, depth perception, and peripheral vision—all of which are limited by nighttime darkness. 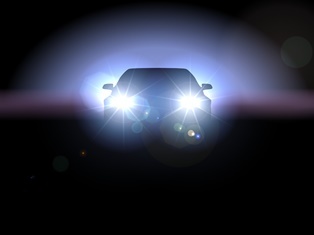 Even with your vehicle's headlights on, visibility is only about 250 feet and while high-beam headlights can increase visibility to approximately 500 feet, their glare can also temporarily blind drivers in oncoming vehicles. The limited visibility gives drivers less time to react, particularly when traveling on roads with higher speed limits. Age can also exacerbate this problem: For example, 50-year-old drivers often need twice as much light to see as well as 30-year-old drivers, according to the NSC. Limited visibility isn't the only challenge associated with nighttime driving. As one might expect, the number of drowsy drivers increases dramatically at night. Not only does driving while fatigued dull concentration and slow reaction time, the National Highway Traffic Safety Administration (NHTSA) has linked it to more than 100,000 police-reported accidents each year. That's not surprising, considering that 60 percent of adults who responded to a National Sleep Foundation poll reported having driven while tired and another 37 percent admitted to having fallen asleep behind the wheel—even if only briefly. Research also shows that drivers impaired by alcohol, or prescription or recreational drugs, are more likely to be on the road after dark. While driving under the influence of drugs or alcohol is unquestionably dangerous at any time of day, nighttime drunk or drugged driving can increase your chances of being involved in a fatal crash by three times or more. If you were injured in a nighttime accident that wasn't your fault, the Morris James Personal Injury Group can help you pursue compensation for damages. To discuss the details of your nighttime car accident case, contact us today to arrange a no-cost initial consultation.